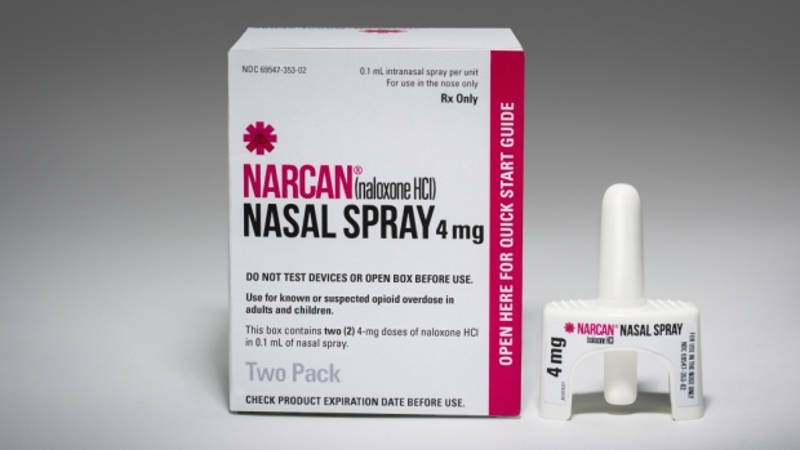 BROCKVILLE – The region’s health unit will start providing Naloxone in a nasal spray in order to treat drug addicts who may overdose. Naloxone, also known as Narcan, has been given in the past by injection for people who OD on opioids, morphine, Dilaudid or Fentanyl. Health Canada approved the nasal form of the medication in November 2016. The spray will be available for free, starting next month (March) from the Leeds, Grenville and Lanark District Health Unit. Jennifer Adams, a harm reduction program coordinator with the health unit, told Brockville Newswatch they are finishing off their supply of roughly a dozen injection kits. “We have 80 kits currently, we just got them in this week. So we will be handing out the 80 nasal spray kits out starting next week. We are capable of ordering bimonthly from the ministry. We will be ordering quite regularly,” Adams said. Adams said the nasal kits will probably remove a barrier to getting the treatment into the public’s hands. She said there has already been requests for the nasal Narcan. “My anticipation is with the nasal spray it’s going to be so much easier to use. I think the injectables, especially for friends and family, has been a bit of a barrier to getting the kits out. If you’re going to have to inject somebody that’s no necessarily easy to do,” she said. Adams was asked whether free antidote kits would, on some level, condone illegal opioid use. “We know that’s not what’s happening because, when you give someone this antidote it’s not a pleasurable experience. Basically what it does is it kicks people to withdrawal and withdrawal is a nasty thing to experience,” Adams told BNW. Adams said this opioid problem doesn’t discriminate and is not isolated to drug addicts on the street. Even more important than the kits, Adams said they are also “running into trouble” of people afraid to call 911 during an overdose, mostly due to fear to persecution for their illegal activities or women with children afraid that child’s services will become involved. While there won’t be a formal needs assessment, LGL health unit spokesman Susan Healey told Brockville Newswatch a person picking up the drug would meet with a nurse as well as receive instruction on administering the spray. “It’s for friends or family of those that may go into overdose,” Healey said. This development is the latest expansion in making treatment available to people who may overdose. In the spring of 2016, the Ontario Ministry of Health made Naloxone available in pharmacies. Health Canada then made the Naloxone kits available over the counter without a doctor’s prescription. The Leeds-Grenville area, like many places in Ontario, is going through an opioid crisis. According to health unit numbers, it’s estimated that someone dies from a opioid overdose in Ontario every 13 hours.